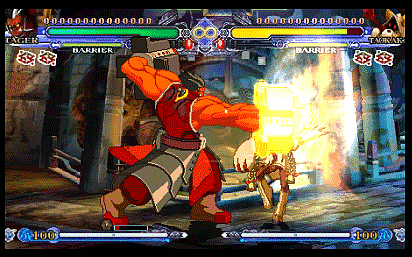 BlazBlue is a high quality 2D fighter brought to you by Arc System Works. 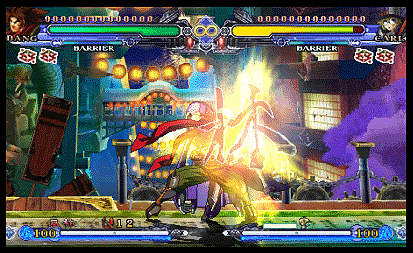 As well as a refined versus mode and arcade mode, BlazBlue offers a wealth of content including a multi-ending story mode, an acclaimed tutorial mode, challenge mode, training mode, Score Attack mode, and an “Abyss” mode. Also being a visual novel, great focus has been placed on BlazBlue’s story. BlazBlue Continuum Shift II is the latest addition to the BlazBlue series. 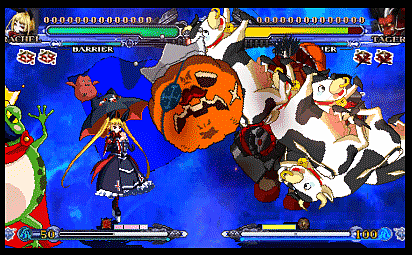 BlazBlue Continuum Shift II continues BlazBlue’s epic saga with two brand new stories. The game will include all of the DLC characters of its predecessors including Makoto, Valkenhayn and Platinum and will also introduce an all new play mode, “Abyss Mode”. In this mode, players will power up their characters against increasingly difficult foes as they descend into the Abyss. With optimised controls, a new “Stylish mode”, and character specific tutorials, everyone from novice to veteran will be able to enjoy the depths and quality BLAZBLUE has to offer. Arcade – Classic single player action – battle through ten opponents on a variety of difficulties. Training – Tweak every aspect of gameplay to help practice your moves and combos. Story – Explore the world and characters of BlazBlue in an epic tale that spans over 100hours of play. Abyss – Adds RPG elements in the mix, as you level up your character with every victory earned. Score Attack – Push your skills to the limit! Defeat seriously tough opponents as stylishly as possible! Legion – Comines strategy with action – recruit characters to your army and conquer territory. Challenge Mode – Teaches you how to get the most out of your chosen character, from their moves to spectacular distortion finishes and incredible combos! Stylish Mode – Simplifies the control scheme so that even “button mashers” can pull off combos like veteran BlazBlue players! Gallery – A wealth of unlockables from movies, to never before seen artwork from the masters at Arc.